Club Penguin Cheats by Mimo777 Club Penguin Cheats by Mimo777: Club Penguin Mine Construction! Wow! New room, garden, path and party sounds awesome! Are you getting pretty stoked about the Earth Day celebration? NEW GAME ALERT! Furry Fable! cool! did u know theres oil in the water bin too? probally because your so smart! Awesome I can't wait for Earth Day its gonna be so cool! the igloo catlog and better igloos came out early! Woah! New Room! New Party! New walkway! New furniture! New Igloo catalog! Loads of stuff on! Thanks for writing all about them, Mimo! this is kinda cool! maybe this is why they are takeing so long 4 da mission? 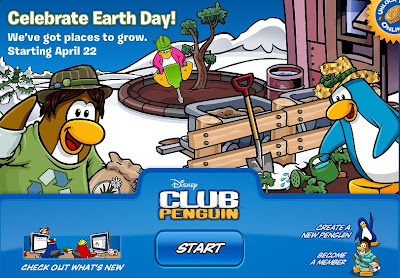 i love earth day i don't play Cp much becoz i think that there's too much membership the only free things are items lol. Please dont put "CPG MOD" after your name when you arent modding! Thanks! Yes, everything is coming out early!! ohhh........ i hope it doesnt wreak my hiding spot. but i like what they are planing. Sweet! Only 6 more days until the party(maybe 5 more days because everything is out early)! I can't wait! That's awesome!!! Can' wait until construction is complete. ;) Thanks for the news Mimo! i was wondering if you could get together a group of penguins to tip the iceberg. 1. Get as many people with puffles on the iceberg and dance. My favorite server is Icebound and all my friends go on it. if you see this, please let me know. I guess most penguin do this so I am one in a million chance of you seeing this. If anyone els hears this please tell mimo777 to help me out. Ya! I know! I can't wait either! Remember not to put (CPG Mod) after your name when you're not modding. Yeah! It's been so... long! Awsome i bets there will be a garden area on the right an the centre on the left and the free item will be a hat and a watering can!!!! Cool, I can't wait for earth day!! I can't wait for Earth Day! There has never been an Earth Day party so I'ts gonna be pretty kool! I'm on my wii writing this. I got internet on my wii. How cool is that?!?! LOL!!!! Please post the first ever WII comment for this site Mimo. Yea a lot of people have been trying to tip the iceburg over but many people also say it's fake I think it's a fake but you might as well try who knows you could be the first one to tip it over until then get your iggy fashioned up before Green Day and have a jolly good day! i think you cna get to the new room thru da mine?? Saweet, i simply cant wait for da party ! OMG My Bday is on 22nd april! Awesome I can't wait for Earth Day it's gonna be so cool! Pst! You shouldn't put CPG mod unless you are answering a question or something! what does the new room look like when will it be released??? Nice homepage for the log in. BTW, your website is awesome. I thought tht disney had already brought it.They had brought it when i started 2 years ago.hmmm? Me either!I wonder what the free item or items will be...? how do you get the internet on your wii? Fair enough but the minute Disney went green with all the dumb friends for change they changed club penguin. In the past years club penguin has been owned by the original creators, they never even said anything about Earth day...hmmm? Well You Cant Say Cuz Earth is for Every one Not only For People That Pay Imagine That You Need To pay money to live On A Planet !!!!! As Far as I know... Anonymous is so you don't have to put your name. Do not tell ppl that when they are anonymous that they actually have to give their name. It isn't nice. G o - E a r t h D a y ! Mabye, but you can only get to the outside of the mine through the map.